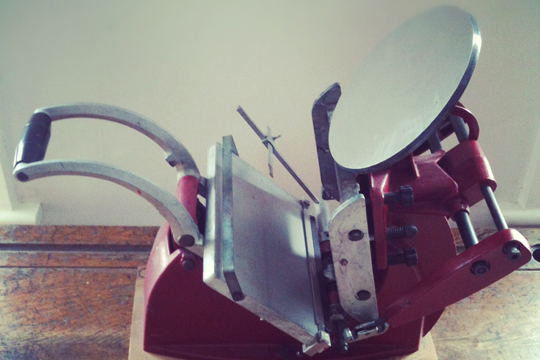 At Making Uncovered, Rachel Stanners of Prickle Press will show how a hand-operated letterpress works, show the equipment used, and how to ink up, set type and print using this traditional technique. Letterpress is an old, tactile craft that requires time and focus to produce a beautiful impression! Prickle Press is a design and letterpress business based in Brixton specialising in handprinted stationery: greetings cards, prints, calendars as well as personalised stationery and wedding invitations. Every design is carefully hand drawn and designed by myself and then handprinted on a one-hundred-year-old Chandler & Price letterpress. Each each piece of card is fed through the press, piled and packaged by hand. The finished product is well worth the hard work and elbow-grease: a luxurious card with ornate designs impressed on the surface. I am taking part because I am passionate about sharing letterpress with the public, giving children and adults alike the opportunity to learn about this old craft. Also, I took part last year and I loved the atmosphere of the event – being surrounded by so many talented makers producing beautiful works and meeting the public. It was an incredibly positive experience for me and I made some excellent contacts. 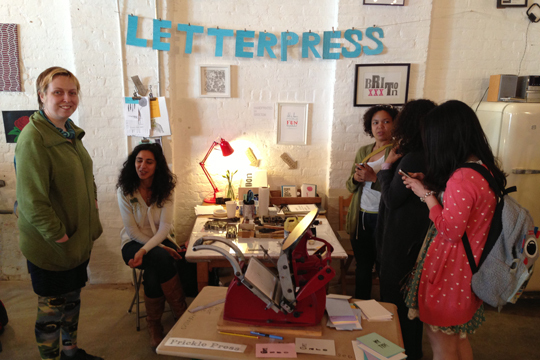 At Making Uncovered I will be giving people the opportunity to typeset and print their own postcard. They can chose from various sets of type I have or pick out already set words and phrases which they can turn into their own personal message. We will set it up on the press and they can print it themselves. The idea this year is to maybe think about someone you know and send them a little card to say hi or wish them well. Envelopes and stamps will be provided too! Prickle Press will be offering drop-in printing sessions at 11.30am-1.30pm and 3.30-5pm. No booking needed – just turn up. Cost: £2 -£5 per card, depending on your message. After a bit of a gap, we’re resuming our interviews with Makerhoodies. In this first one, Rachel tells us why she switched from set and costume design to printing with Prickle Press – and where to get great-value flowers in Brixton. 1. You studied set and costume design – so how did you end up making and selling prints? In 2009 I was a year out of my MA in scenography for dance and was getting some odd bits of work as a designer while holding down a full-time job, but I wasn’t feeling particularly inspired by the work I was doing. At the time my partner was visiting from Australia and he bought a letterpress printer. Neither of us had done any printing before, but we loved it! Instead of being told what to do by other people, I could do exactly what I wanted. And it’s very tactile – I use sets of metal and wooden type, often really old. Some of the cards I have on Makerhood are made from vintage wooden type loaned from a shop called Mr Magpie in Brighton. 2. So you are now a professional printmaker? Yes, I work from home, printing four days a week. Now we have a much bigger press, about 100 years old, made in the US. It’s a massive piece of equipment and weighs a ton – I’m worried about it falling through the ceiling into our living room below! Although I don’t have any formal training I’ve always done a lot of drawing, and I like to combine type and illustration. So I draw up designs, turn them into PDFs and then get them made into polymer plates for printing. 3. And how did the name of Prickle Press come about? I wanted the name to be quite personal – something that meant something to me. Prickle is my partner’s nickname, because his surname is Burr. And Prickle Press rolls off the tongue nicely and is quite cute but with an edge – rather like my work! I like to create something that’s not too twee, that makes people think. 4. 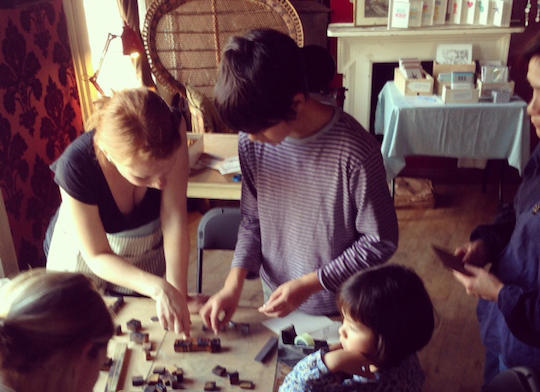 Why did you join Makerhood? Last Christmas I did a market at the Living Room, and someone came round giving out flyers about it. So I looked it up but wasn’t sure how I could get involved at that stage. But then earlier this year I decided I wanted to meet more people in the area and get more of a sense of community, so I went to a volunteers’ meet-up. I really like the fact that Makerhood is creating a network of local artists and designers – working at home on your own can be quite isolating. And I can print bespoke business cards , so maybe I could also make new business contacts! 5. Do you feel isolated living in Brixton? Not at all! I’ve lived here for five years, almost longer than I’ve lived anywhere else. I came back from Canada and my brother was living here, so I moved in with him and have no plans to leave. I think it takes a long time to feel at home in London, but I know where to find what I need here now. It’s changed a lot, but it’s quite exciting to see those changes. 6. So tell us about some of your favourite Brixton insider tips! I’m a big fan of the flower stall outside Brixton tube – they sell the most affordable flowers I’ve found in London and always have some more unusual ones. And my favourite restaurant is Elephant in Brixton Village – the freshest, tastiest curry in London. If I could be guaranteed a seat I’d be there every Saturday evening!